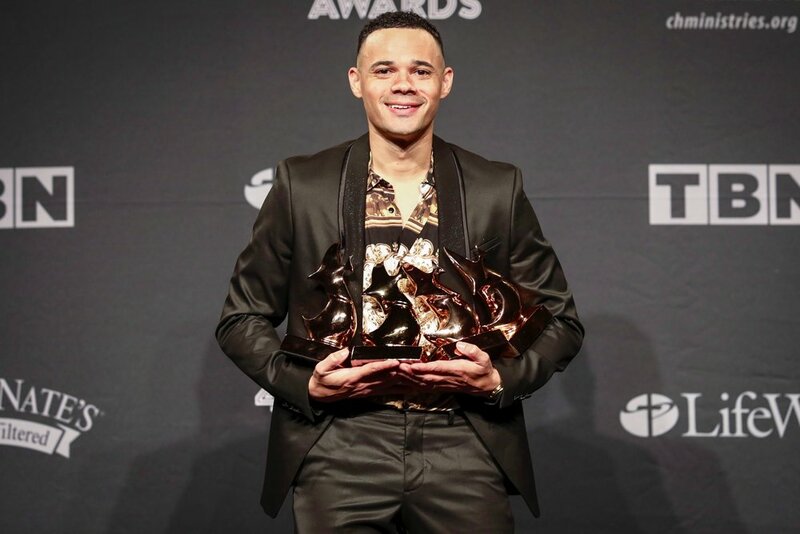 (October 17, 2018 – Nashville, TN), Tauren Wells dominated the 49th annual Gospel Music Association’s Dove Awards winning four of his eight nominations. Wells picked up four awards for Contemporary Christian Artist of the Year (Category 5), New Artist of the Year (Category 9), Rap / Hip Hop Recorded Song of the Year (Category 11) and Pop / Contemporary Album of the Year (Category 23). The 49th annual DOVE Awards were taped in Nashville, TN at Lipscomb University and will broadcast on TBN on Sunday, October 21st, 2018 at 9/8C. Four-time GRAMMY® Award-nominated Tauren Wells debuted his solo music in 2017 with the dance-able pop hit, “Love Is Action”, which held the No. 1 spot at CHR radio for eight weeks and the hard-hitting “Undefeated” featuring rapper KB. Those hits were then followed by the GRAMMY-nominated and RIAA Certified GOLD “Hills and Valleys”, the piano and cello-driven thought-provoking track that quickly climbed the radio and sales charts and jumped to the Top 10 at the Christian Airplay radio chart for multiple weeks. The following single, “When We Pray” also hit the Top 10 at Christian Radio. His current single “Known” is already making a splash as it hit the No. 1 spot on the Billboard CHR Chart. Tauren Wells is the former front man of GRAMMY® Award-nominated band Royal Tailor, father, songwriter, worship academy founder, multi-instrumentalist, and performer, and his deep desire to draw people closer to their identity in the Lord is apparent in all he pursues.